The great physical strength and versatility of this rush make it an asset in wetlands. Juncus kraussii prevents erosion and also make a perfect fibre for weaving. Juncus kraussii (incema) is a perennial herb that grows up to a height of 1.5 m and grows in large colonies where it occurs. Its leaves are tough, round and spine-tipped, and the sheath is shiny black (Pooley 1998). The purplish brown flowers appear between October and February and are topped by spine-tipped bracts. This plant is listed as not threatened. Juncus kraussii grows in colonies in KwaZulu-Natal, Free State, Eastern Cape, Western Cape, Lesotho, and Mozambique. It dominates salt marshes where salinities are low (rarely exceeding 20 mg per litre); and often extends into dune slacks bordering salt marshes. It is also found in estuaries in the following areas: (i) shallow parts that remain fresh due to the mouth closure, (ii) fresh water seepage zones, and (iii) areas of strong seasonal inflow of fresh water into the system. (Allanson & Baird 1999). The plant was named after Christian Krauss, a 19th century German naturalist and museum keeper who traveled to South Africa. Juncus (Latin) means rush. Juncaceae is a family of eight genera and about 310 species (Haines & Lye 1983), widely distributed in Africa, South America and New Zealand. Three genera occur in Africa and the remaining five genera are found in South America and New Zealand only. Juncus is a large genus of about 220 species widely distributed in temperate regions, but also reaching the arctic. In East Africa, four species are found in Uganda and five in Kenya. 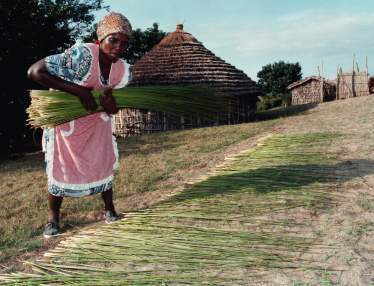 Juncus kraussii, among other rushes and sedges, is harvested and used for weaving traditional sleeping mats across many rural areas of KwaZulu-Natal. This rush is popular for making sleeping mats (amacansi ), baskets, beer strainers, conference bags and numerous craftwork products. The reason for its popularity is the fact that it is strong and yet easy to bend during craft construction. Products made from J. kraussii are not only used for day-to-day household uses, they are also sold to gain an income. This sustains the livelihoods of local households and contributes to the regional sustainable economic development. Some products e.g. 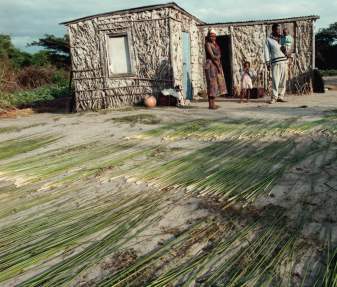 sleeping mats are used in traditional weddings as customary gifts that the bride gives to the groom's family in a traditional Zulu wedding settlement. The gifts are collectively known as umabo, and J. kraussii has the highest status of all the materials used for making amacansi. 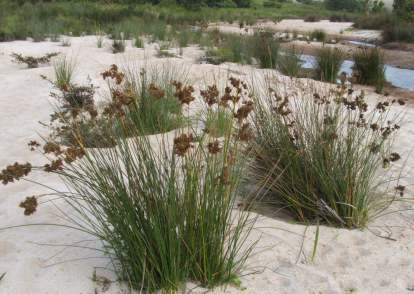 The great demand for Juncus kraussii because of its economic value has resulted in large-scale harvesting of the plant in the wild. This has resulted in certain areas not having enough incema to harvest. People who want to collect incema in these areas must now travel long distances to find it. This problem has been dealt with by cultivating it in areas that are suitable. J. kraussii can grow on many soil types ranging from sandy soils to clays provided there is enough water, which is an important growth requirement for this plant. Mander et al (1995) give a comprehensive step-by-step process on how to grow incema. Plant both seedlings and plants into individual holes-this is called pit planting. Plant after the first rains except in cases where irrigation systems are used. Even in irrigated areas, plant in spring when conditions are conducive for rapid growth. In large irrigated fields, plant seedlings and plants in lines 15 cm apart. Within lines, plant seedlings and plants 15 cm apart. These spaces may appear wide, but remember that incema grows rapidly and quickly fills the spaces between the plantlets. Use the same planting system in small fields at homesteads. Always remember that the most important growing requirement for incema is water. Where weeds start to grow between the incema plants, pull them out by hand after irrigation or rain. The weed growth often subsides after approximately 18 months because at this stage the plants have grown large and closed the spaces between them, thus making it difficult for weeds to grow. There is no weed killer that kills weeds without affecting incema so hand weeding is the only option. There are no known insects or small animals that will damage incema, however, it is important to keep livestock out of the incema fields. If possible, fence the your incema field so as to exclude all unwanted animals. If you plant incema in spring and the plants have received enough water, you should be able to harvest some of the incema in April and May of the following year. After the first year you can harvest it every year in April and May for at least seven years. Allanson, B. & Baird, D. 1999. Estuaries of South Africa. Cambridge University Press. Haines, R.W. & Lye, K.A. 1983. The sedges and rushes of East Africa : a flora of the families Juncaceae and Cyperaceae in East Africa -with particular reference to Uganda. East African Natural History Society, Nairobi. Mander, M., Heinsohn, D. & Mander, J. 1995. 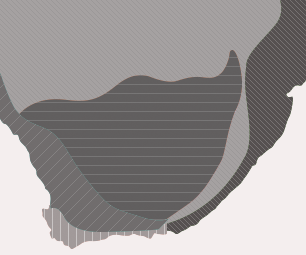 Catchment action: how to grow incema. Institute of Natural Resources, Scottville.